The last 20% of a project accounts for 80% of the total costs. This is a saying that is often all too true. One way to minimise the risk of this occurring is to utilise model-based development. By providing a visual representation of everything in a model from which everyone involved can work, makes it easier to identify problems early on, and to then implement countermeasures before they progress to the production stage and become very expensive to rectify. Today, all design work at Saab's Aeronautics business area is model-based, and this even applies to operations like maintenance. 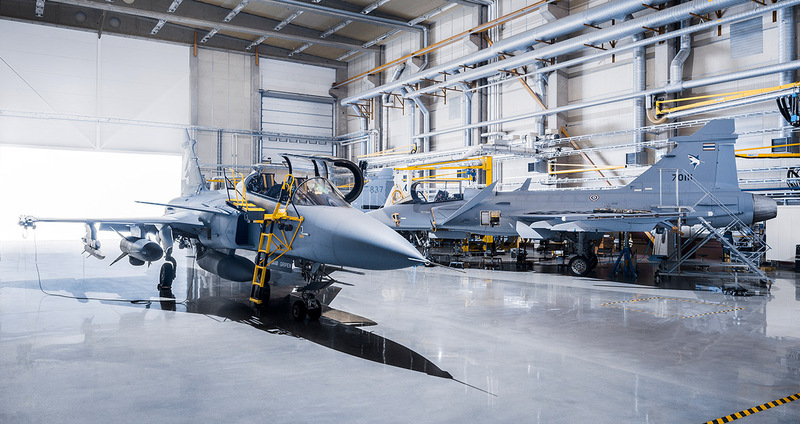 "A considerable benefit of working with model-based development is visibility – that everyone can see the same thing and everyone works with the same model at the same time," says Lars Hellmark, who works with Product Data Architecture within maintenance at Saab. Among other things, a shared 3D model allows for more opportunity to work in parallel. "You no longer have to wait for a designer to pull out a drawing of the working copy with which we will work. Now, everyone has direct access to the latest model as soon as it's saved in the system," says Lars. Since the model contains everything, everyone is able to work on their specific part without having to wait to receive their own copy of the drawing. And this increases opportunities to identify problems at an early stage, and helps to avoid the 20/80 pitfall. "Previously, we had to assemble various drawing schematics to understand how something would look in reality. This made it difficult to see where a pipe could be pulled without it conflicting with something else. Now, the model allows us to see, straight away, where there is place and where it can cause a problem," says Per Pettersson, Technical Manager Availability Performance at Saab. This has resulted in a dramatic decrease in the number of conflicts and the work can be done more efficiently. Depending on how experienced a person is, it can be difficult to see the big picture by looking at several different drawings at once. "It used to be like building a puzzle when we tried to understand how everything would come together. To gain a good understanding, it was not uncommon for one to go out to an aircraft and take photos of the component you were working on. Today, we have a model that, by and large, contains all the systems and affords us a much better overview of the system in its entirety," says Hans-Olof Berlin, Manager Integrated Logistics Support at Saab. Another important factor in avoiding delays and cost overruns is to involve the customer in all stages of the process. A model makes it easier to visualise how the whole system will look and to understand the reasoning behind it. "We have had representatives from the Swedish Armed Forces and discussed with them if, for example, it makes sense to build in a radar in a specific way. Then we can look directly at and refer to the model, which makes it infinitely simpler for the customer, who does not work with these things on a daily basis, to understand the repercussions of different options than if we were to present myriad drawings for them to try and assemble in their heads," says Per Pettersson. Model-based development enables us to avoid problems involving conflicts in the final stage of a project when the customer realises that what they had imagined does not correspond to what the supplier is actually delivering. Saying to a customer: "but you saw that on the drawing" is not especially popular. "By having the model as a support material, everybody can see exactly how the design will look. It also makes it easier to have a productive dialogue regarding necessary compromises as it's possible to clearly show where the problem lies and how different options will affect the end-result," says Hans-Olof Berlin. Subcontractors and consultants constitute other groups who become simpler to utilise if there is a 3D model from which to work. "The model allows us to employ people who are extremely knowledgeable within a certain area, but who may not be used to interpreting drawings. For example, someone who is highly conversant in fire protection. We can then convey our reasoning for a solution through the model and ask whether it will work from a fire protection perspective," says Hans-Olof Berlin. "It will all fit together later on"
It's not only construction costs that are important, but costs over the full life-cycle are also crucial and, in this, the model can also play a vital role. "It may not be certain that it will be cheaper when being designed, but it will all fit together later on. For instance, it may be cheaper to implement changes when you have a model from which to work, which also makes maintenance more efficient," says Lars Hellmark. An example of this is that a user, at present, may need to take along eleven different instructions out to the aircraft in order to understand how a hydraulic pump should be replaced. It's difficult to gain a full overview of what needs to be done by reading these instructions one by one. In the future, all of these printed instructions can be replaced by a model. "We can now create a narrative using the model in which we can show, image by image, that you will first need to remove the hatch, then fold over this hose and so on. Instead of first letting someone create a process for the job that needs to be done and then handing it over to someone to write the instructions and someone else to do the illustrations, we can now create the illustrations directly in the model, use images to show how the work should be carried out step by step, and restrict the accompanying text to only that that the person needs," says Lars. Model-based engineering solves many problems and offers many possibilities. It doesn't solve everything, but it's indubitably better than working with drawings – as was done in the past. "I don't think anyone these days wants to go back to working with drawings. Rather, it's about developing working methods for models so that we can work more proactively and avoid having to deal with problems at a late stage just because we missed something earlier. Quite simply, we want to use models in order to work proactively going forward," concludes Lars Hellmark.